Four days before the final order cut-off for the special cut-off Marvel Star Wars #1 covers and send them in for a new variant, Dark Horse Comics has sent retailers two Barb Wire Ashcans. These are 16 page flip books features part of the Barb Wire story and part of the upcoming King Tiger book. 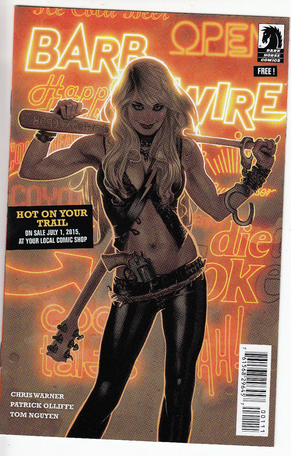 This ashcan also features a cover by Adam Hughes. This book is going to be like the Fight Club ashcan sent to retailers two months ago where the initially sell above $20 but then start averaging around the $10 mark, like the Fight Club, keeping that in mind, this is not a book to be holding onto.